What is an Oklahoma Eviction Notice? Oklahoma Eviction Notice: What Is It? An Oklahoma eviction notice is a legal document that signals the start of the legal eviction process. Written by the landlord or the property manager, this document (better known as a notice to quit) is used to both document and inform. It documents the lack of lease or rental agreement compliance of the tenant. It also informs the tenant as to what happened and gives them a certain amount of time to correct the problem or vacate the property. All Oklahoma eviction notices must comply with the state’s landlord-tenant laws. What Are the Components of an Oklahoma Eviction Notice? The name of the document. This may seem obvious, but the name generally includes the number of days the tenant has to fix the issue or leave the property and the type of notice to quit. You can see the naming conventions below for the most common Oklahoma eviction notices. The date that the eviction notice was created. This is important because it is what the timeline will be based on. 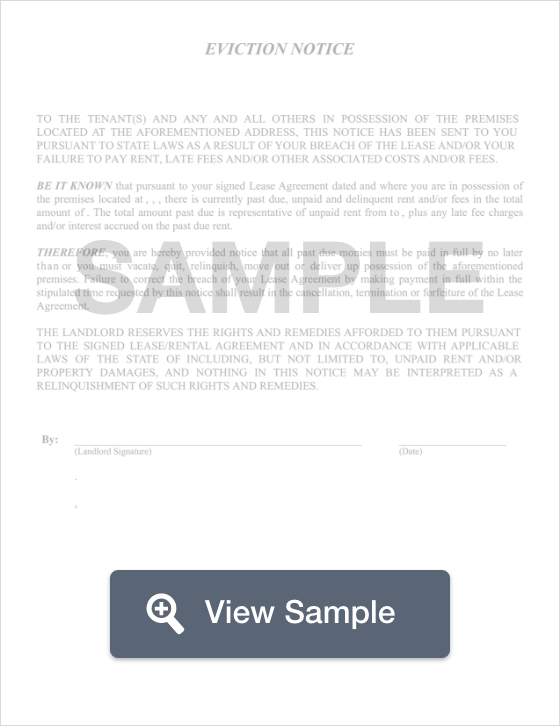 The name of the tenant or tenants who signed the lease or rental agreement. The full address of the property including building number, unit number (if applicable), city or town, and the county where the rental property is located. An explanation on why the eviction notice was issued. The number of days the tenant has to fix the issue or vacate the property. The printed name and contact information (including a phone number) for the landlord or the property manager. The signature of the landlord or the property manager. A Certificate of Service is not required in the State of Oklahoma although landlords and property managers are encouraged to keep a copy of the eviction notice for their records. Service must be done in a way that the state considers legal. Those ways are personal service on the tenant, left with a resident of the rental property who is at least 15 years old, sent via certified mail, or post the notice somewhere on the property where the tenant is likely to see it (such as the front door). After service, the landlord or property manager must wait the statutorily prescribed amount of time to know whether the tenant will comply. If they do not comply by the end of the timeline, a lawsuit may then be filed. A 5-day notice for non-payment of rent is used when the tenant doesn’t pay their rent on time. It gives the tenant five days from the date of the notice to pay their rent or vacate the premises. It is governed by § 41-131. The notice should include the full amount of rent that is past due, how the rent may be paid, and where it should be paid. A 15-day notice for non-compliance is an eviction notice governed by § 41-132(B). It puts the tenant on notice that they’ve violated the lease agreement in some way and that they have 15 days to correct the issue or leave the property. This notice is NOT used for late rent or for illegal or harmful activities. The landlord or property manager should give a clear explanation of how the lease was violated as well as the date by which the issue should be corrected. There is no prescribed amount of notice required if there is illegal or harmful activity happening on the property according to § 132 (C-D). This form of eviction is used when a tenant engages in an activity that somehow threatens or endangers the health and safety of other tenants or damage to the property. The landlord may elect to tell the tenant to correct the condition immediately or they will revoke the agreement. Ending a week-to-week tenancy can be done by either the landlord or the tenant. So, it’s not really an eviction notice. With this notice, the recipient is made aware that the tenancy is ending and that the property will return to the care and custody of the landlord in seven days. It is governed by § 41-111(B). A 30-day notice to terminate a month-to-month tenancy is used to end a monthly rental or lease agreement. It can be drafted by either the tenant or the landlord. It should give the recipient 30 days of notice that the property should be vacated at the end of the 30 days. This notice is governed by § 41-111(A). What Are the Legal Considerations of an Oklahoma Eviction Notice? An eviction notice must be legally served on the tenant, a member of the household who is at least 15 years old, through certified mail, or by leaving a copy of the notice on the front door or in another conspicuous place on the property. If the tenant doesn’t comply with the notice by the deadline, then a lawsuit may be filed against them. Until the landlord or property manager receives a court order, they may not lock out the tenant, disconnect utilities, or remove the tenant’s property from the rental. Self-help eviction is the term used to classify those actions. Without a court order, they are illegal. Landlords may not evict a tenant simply because the tenant reports the property to the housing authorities for code violations or uninhabitable conditions. Landlords have a legal obligation to maintain the property in a way that is safe and that creates a habitable living condition for the tenants. Landlords must follow federal and state law when it comes to their rental property. They may not evict someone because of their skin color, race, religion, country of origin, gender, disability, or family status. If a landlord engages in illegal eviction of any kind, the tenant may have the legal right to sue for financial compensation. The landlord may also be fined if the court decides that they’ve broken state or federal law. Oklahoma tenants have rights even during the eviction process. If you live in public housing and do not pay your rent, the eviction notice should be a 14-day notice. It’s important for you to read and understand the contents of the eviction notice. You need to understand why it was issued and how long you have to either take care of the lease or rental agreement violation or vacate the property. Not all evictions are legal. If the landlord does not have a court order, they cannot lock you out or disconnect the utilities. They also may not dispose of your belongings without a court order. It is also illegal for you to be evicted for reporting code violations or because of your race, color, religion, gender, disability, home country, or family status. If you need to learn more about the eviction process in Oklahoma or if you think that you may have gone through an illegal eviction, you can talk with a landlord-tenant lawyer. They can evaluate the situation and advise you on your potential rights and the process. You can also contact legal aid and apply for pro bono or low-cost legal help. You can reach out to the University of Oklahoma College of Law, Oklahoma City University School of Law, or the University of Tulsa College of Law and ask if they have an active legal clinic. Sometimes, legal clinics offer services to tenants that are low-cost or free. Oklahoma landlords must comply with both state and federal law. The eviction process for Section 8 and public housing is a bit different. So, if you’re a landlord that has a rental that is Section 8 approved, make sure that you do your research or talk with a landlord-tenant attorney to ensure that you follow the law. Also, remember that as a landlord you must ensure that proper service of the eviction notice takes place and that you wait the full time period for compliance. At the end of that time and if the tenant hasn’t complied, you may then file an eviction lawsuit. Until you get a court order, you cannot change the locks, disconnect utilities, or dispose of the tenant’s belongings. You also may not evict someone due to factors that both federal and state law says are discriminatory. This includes a person’s real or perceived race, gender, skin color, family status, religion, country of origin, and physical or mental disability. You also may not engage in retaliatory eviction. That is, you may not evict a tenant because the tenant reports you or the rental property to the housing authority because of code violations or uninhabitable conditions. As a landlord, it is imperative that you understand how the eviction process works in Oklahoma. To learn more or to have your questions answered, contact a reputable landlord-tenant lawyer in the county where your rental property is located.